In 1975 the TL250 production started. The first details for this bike anounced a power output 16,5 Hp at 7.000 rpm, but finally the satandard production reduced that at 16 Hp at 8.000 rpm. Honda produced roughly 4.000 bikes mostly for the Us market. The USA rider Marland Whaley was riding with this bike at those years. The bike inherited the TL125 design. Price was somewhat cheaper than Spanish bikes. The nice Honda TL250 was painted Honda Metallic Silver and the nice Honda Red Accent color. 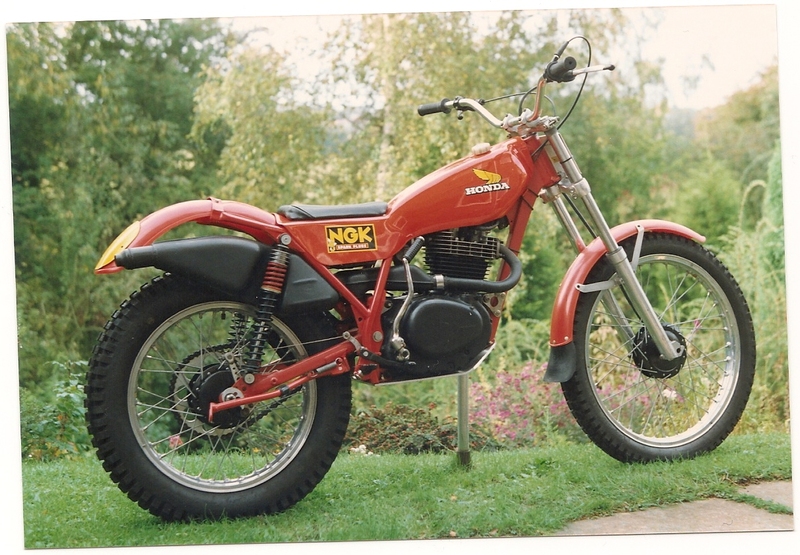 Derek worked at the Puch factory, Graz, Austria and then worked for Montesa in the USA. He was one of Scotland’s best trials riders, along with his elder brother Norman and both rode in the 1968 ISDT in Italy, then Derek rode again in 1969 – Garmisch Partenkirchen and 1970 at El Escorial, Madrid! Thanks to my friend Patrick and son to sent me this nice picture for Christmas time. In 1975 Sammy Miller introduced a big improvement on the TL125 frame. He developed a new frame for the 125/150 Honda. This frame was built using Renolds 531 tubes and saves more than 11Kg and was finished chromiud plated. The sump shield was screwed. High-Boy frame was designed to accept all the standard Honda 125 parts. The High-boy Sammy Myller frame was 11Kg lighter than the standard Honda TL125 frame. An original one High-boy Sammy frame using an XL180 engine. The picture was sent by Dean Horwood from UK. Thanks to Alan Johnstone for these pictures of a original Hi-Boy frame. This one, under restoring, is numbered as 226, and as Alan says less than 500 units of the original 1970’s were made. According the information I have I don’t know any number higher than 400. Thanks also to Frank Brzeski for to send me these interesting projects. First we can see two Hi-Bot frames, one original from the 70’s and second one a 2010 reproduction. The most interesting is that on following pictures you can see the original one mounted with a 1978 TL125 engine and the 2010 frame assembled with a TLR200 engine, both projects thanks to Frank. Thanks to Robert Russell for this nice black painted High boy TL frame, with suzuki forks and home made silencer, 200 cc displacement. Photo taken by Jimmy Young © thanks to John Moffat. This nice and rare Honda trials was built at the shop of Vic Allan Motorcycles in Bathgate, West Lothian, Scotland during the 1975/76 season by the mechanic Derek Green. It was a 250 XL Motorsport Honda converted for trials similar to the Jefferies Honda. Later it was attached to a sidecar for a while.
. Shocks were Girling Gas Shocks. Bike information also thanks to John. The TL50 went on sale on 1976. Its stylish lines came from the larger TL125 and TL250, and it was equipped with a 5-speed transmission. Sammy Miller developed in 1976 this nice Long-stroke 305cc Honda. With a new frame and the 250cc bored out to 305cc. Softer cams and small bore carburettor along with many hours, produced avery competitive bike. The weight was 90 Kg and was equiped with his own Hi Boy chrome plated Renolds 531 tube Frame. Air cooled, four.stroke, 4 valve with chain driven camshaft. Thanks to Pat from Aspen Cafe to sent me these valuable pictures. Please respect its Copyright. Rob Shepherd won the British Championship in 1977 with this 305cc long-stroke Honda bike. Marland whaley from the Honda USA Team also rode with this special machine. Actually, the ‘long stroke’ is commonly called RTL 305 and the ‘short stroke’ RTL 306 because it refers to their actual capacity, but at the time Honda called them both RTL 300 (this is what is stamped on both types of engine). *comments thanks to Jean Caillou. Today we still can see some units as this one (number 2) on the RTLR Club Europa meeting at Samoens. The ex-Rob Shepherd RTL 305 ‘long stroke’ made in 1975, that he rode in 1977 to win the British Championship and one World Round in Finland (he also rode a white RTL306 ‘short stroke’ that year, but not so often). Thanks to Jean for this information. On the top very nice restored Honda 305 Long stroke. This bike was found by Mervyn Smith in the Honda race workshop at Chiswik in February 1990 by this web site friend Mervyn Smith. Once restored the bike was sent back to the Honda Museum Collection in Japan. We are not sure if they lost again…. Mervyn had the kindness to send me these pictures and the kindness to tell me interesting informations about these Honda old time machines. Mervyn Smith was working at Honda UK in the motorcycle department for 23 years. Not nothing!! Mervyn took this picture in 1978 at Greensmith National Trial, Shropshire. Rider is Rob Sheperd and the section is Crumps Brook. Thanks Mervyn!. The Honda Trials History friend Alan Johnson sent me this nice and valuable information about his Honda 305. Here is the history of his TL305 and some back ground on himyself. Alan Johnsosn started riding in trials in North Yorkshire in the1970s. Starting on a Peter Gaunt Suzuki, moving on to a Dalesman and then his first Ossa 250. His father at this point owned a Honda dealership in Harrogate North Yorkshire where he also sold Ossa. In the early 1970s they gave John Reynolds his first sponsored ride through Cliff Holden at Ossa UK. John and Alan did all the schoolboy nationals, Alan also had a sponsored Ossa Cantilever 250. After Ossa’s demise, he moved on to a Montessa. He started to take interest in the then Gaunt Honda (XL250) .This was then produced by Nick Jeffries, known this as the ‘Jeffries Honda’. They had one of these in his showroom, it caused great interest. This was when Rob Shepherd was riding for Honda UK. Honda then went on to bring in the little TL125, they did several engine conversions on these to 220cc .This involved a Dixon Racing piston and his own conversion of a long stroke crankshaft. This urged Alan on to want to ride a 4stroke. Honda UK then imported just over 60 TL250’s, luckily they managed to get two, one was for himself. The bike as standard was less than competitive and needed lots of work, weighing in at 239lbs and 9 inches of ground clearance Alan had to strip it and start from scratch to make it competitive. He had the frame made for him by Keith (ozzy) Horsman of Silsden, he was well known for his frame work and reed valve conversions for Ossa’s. After many months of testing Keith came up with the frame, at this point it still had the standard tank,seat and exhaust on. The next step was the engine,tank,and exhaust modifications . The exhaust came from Rob+ the works alloy kickstart and also a fibreglass works tank (Alan never used this as it just looked too nice). Nick Jeffries provided him with all the works carb parts. Whilst rebuilding Mick Grants engine Alan was able to see what had to be modified on the camshaft. The 305 over bore kit again came from Dixon Racing . After he rebuilt the engine he modified the works exhaust to fit the new frame and the plan now was to lose as much weight as possible. Our friend Alan fitted lightweight footrests, a dural sump guard and alloy mudguard stays. The fuel tank cover was from a Seeley Honda. The alloy under tank Alan hand formed and welded himself, it only holds 1/2 a gallon of fuel when full. Alan’s Honda TL305 now weighed 182lbs and 13 inches of ground clearance this was a vast improvement on the standard bike. Then started the testing, John Reynolds and Alan spent many hours testing the improved TL against his works Suzuki. It actually proved to be too light, it tended to bounce on rock steps. After weighing John’s Suzuki which was 198lbs Alan decided to put some weight back on to the Honda. He replaced the alloy kick-start, dural sump guard, alloy mudguard stays and lightweight footrests all replaced with steel even some of the titanium nuts and bolts had to come off to get the bike up to 198lbs. Alan Johnson rode the bike for 4 Years and won many awards including best 4 stroke in the Manx 2 day trial in 1980. The bike still starts and runs very well. Thanks a lot Alan!! a gripping story!! Mr Hiroshi Kondo had the kidness to sent me this nice picture from 1976 when he rode at SSDT with this very special Honda Works RTL305 long stroke type. He rode later, next year, at World Trials Championship with the upgraded Honda Works RTL 306 Short Stroke type. HIroshi Kondo rode at 1977 World Trials Championship with the upgraded Honda Works RTL 306 Short Stroke type. RTL 300 named by Honda. Also Marland Whaley was riding at 1978 Scottish Six Days trial, Marland had problems with the machine and retired on Wednesday. After that, Marland ended the Contract with Honda and signed by Montesa starting with the new 310cc prototype. The pictures of this machine and the Marland Whaley were taken by the friend of this site owner Pat Criou at Oberiberg, Switzerland in 1978.
the goal to improve and potentiate the 305 machine, in 1978 Rob Shepherd received a new engine with a new capacity of 359cc displacement, with 82mm bore and 68mm stroke. The new engine was capable to give a spectacular 19,8 Hp at 6.500rpm. This big machine was the most powerfull bike at this time, maybe too much, because as Rob said, the 360 was a hardest bike to ride. Again Honda rider Kiyoteru Hattori also at Scottish Trial but now in 1980. Picture thanks to Iain Lawrie © who took this nice pic at SSDT Cailliach section. Thanks a lot Iain! The 1984 Honda RTL 360 at Motegi Museum in Japan At only 18 years old, Honda gave the powerfull RTL 360 to Eddy Lejeune. Kiyoteru Hattori was another rider from Honda Trials Team that also rode the RTL 360. First Honda 360 prototypes were made early 1978, Rob Shepherd was one of the first to ride on this big machine. The new machine was the most powerfull trials bike never made. After several problems at first time, the bike was revised by Honda due to a overheating problems. The History of the RTL 360 was long and difficult to follow, There was a lot of improvements and different prototypes. At same time very few units were made, only works bikes. The RTL 360 from 1980-81 was made for Eddy due to Shepherd was retiring from World Championship competition in 1980. Then, Lejeune started at Honda Team as the official and number one rider. This season was 1981 and he rode now with his loved RTL 360. Remember that one year later, in 1982 he won with this wonderfull machine his first World Trials Championship. Eddy Lejeune, 1982 World Trials Championship, Coll de la Presolana, Italy. Picture thanks to Gabriele Milan from Italy. In accordance to Tommy Sandham’s journalist expert the RTL 360 was the best bike he never rode, on the same way also he reported that in opinion of the top British riders have ridden the bike, it was the best trials bike of the moment. As telling the 1983 American Motorcycles magazin, Schreiber said “Eddie’s an excellent rider, but the bike is also excellent in muddy and wet conditions. There is small quantity RTL 360 survivors today. This 1984 RTL 360 pictured one owns at Italian collector. Maybe one of the most expensive Honda trial bikes and of course difficult to see. This picture taken by Antonio Maugeri in shows the 1982 Lejeune’s RTL 360 Painted all Red color, Silevr grey engine, Silver aluminum wheels, Today, the bike is still alive in France, belongs to a French collector. Thanks for the picture Antonio!! Thanks to Dean here a nice picture from 1983 World Championship. Eddy Lejeune with the RTL360 83. Eddy Lejeune at World Round in Texas with the Honda RTL360 in 1983 Picture thanks to Albert Wing. This original one 360 from 1982 owns to my Honda Trials History friend Carlo from Italy. Grazie again Carlo!! The RSC Honda TL200R was the first of the dinasty of nice and competitive 200cc RSC Honda trials bikes. This model started using the TL125 (coming from Honda XL125 engine) 125cc engine (no CDI yet) upgraded to 200cc. Ignition system was the same used on the 1976 TL125 placed at camshaft and covered with the 125cc engraved cap or some times without engraving letters. This engine was fitted with a extra plate on the flywheel crankcase and one just on the base of the cylinder. Oposite of the TL200R and following RS engine family, this engine had no numbers and no identification. Take care, no numbers means never engraved, NO DELETED. This bike was offered with two colours petrol tank and seat, White and red. The tubular frame was ever black powder painted. The frame was made in too thin section, only 84Kg weight, (competitors at this time usually had 92-94Kg weight!!) because of that, had some strength problems. Carburetot fitted was the little Keihin used on the TL or XL 125 engines, although later on the TL200RII the Honda Racing Service used biger Keihin 22 used on the 200cc engines. This bike was a super light trials bike at the moment, easy to ride, and with an exceptional engine withan incredible inertia an torque. This was the Eddy Lejeune’s bike used on the beginning of his World Trials Championship, from 1976 to 1979 when he inherited the Sheperd’s RTL360. Also the site friend Hiroshi Kondo used this bike at Japan Trials Championship at 1976 and 77. Thanks again to the friend of this site Hiroshi Kondo to allow me to us these nice pictures. The first Honda TL200R white color. © Hiroshi Kondo for The Honda Trials History web use only. In opinion of Hiroshi Kondo the bike had the gravity center too high, in fact the second model Hiroshi had, was improved by him reducing this problem. Eric Lejeune, Eddye’s brother, also reported some strengh problems (Trial Classic Magazine very interesting article) and a tendency to lose the ground from the front wheel do tue its low weight. Eddy added 600gr extra weight attached on front suspension bars. The singular silencer engraved with the RSC letters was the same that later used the TL200RII and the RS200T. Thanks again to Hiroshi Kondo to allow me to us these nice pictures. The improved Honda TL200R red color. © Hiroshi Kondo for The Honda Trials History web use only. This is one of the nicest and original TL200R I never saw. Except rear shock absorvers all the parts were stricty followed as they originaly were. Thanks to Enric Basté. Enric made a very hard and professional job on the rebuilding and restoring of this unique bike. Part by par, screw by screw and strictily following its originallity the bike was remade as a jewel. Here you have the result, enjoy!! The T305L Honda Fraser was made by David Fraser Products from Redditch, UK. Fraser made a new chromium plated frame for the Standard Honda TL250, to reduce the weight. Also in some units enlarged his capacity to 305cc to get more power. The bike was more competitive than the standard TL250. Thanks to Martien from Holland for this Fraser frame picture. Here we can appreciate fully naked chromed plated frame. Joan Figols, from Berga, Made this FRASER frame replica. He made some units after testing a T305L FRASER. He told me enjoyed a lot with his maneuverability and driveability. Joan also made a 305 Long Stroke, Rob Sheperd/Whaley gas tank replica and made this interesting mixture. FRASER frame with TL250 engine (enlarged to 305cc) and 305 look. Thanks Joan to send me these pictures and info.. In 1978 David Fraser of Redditch developed this special machine. In this bike he used the XL250S (1978) twin exhaust engine. The bike was kown as Fraser Honda HT250. THe HT250 was a very special and rare bike. Today I only have reference from two only HT250 survivors. One under restoration (Honda Trials History) and second one from Callum Roberston from UK who had the kindness to sent me some pictures. This one (The Honda Trials History) and still under restoration could be one of the few David Fraser HT250 survivors today. Nice restoration (not finished yet) from Joan F. (The Honda Trials History). Here you can see twin exhaust system. This very competitive trials bike mounted for first time on one trials bike history a unusual intermediate chain. This is the later JJ cobas double chain system frame. Picture property of The Honda Trials History webpage. Funny and clever intermadiate chain system.This unit without tensioner but using half link chain. The Honda Trials History unit. Same chain system.This unit with tensioner short chain. Callum Roberston unit. This rare bike was made in a really small series. Less than twenty were built. This second chain comes from gearbox sprocket to countershaft mounted on the swinging arm pivot. The large chain comes from this swinging arm pivot to the rear wheel. The innovative system allows to maintain a constant chain tension without any tensioner help. Thanks to Callum Roberston for these pictures from his HT250. 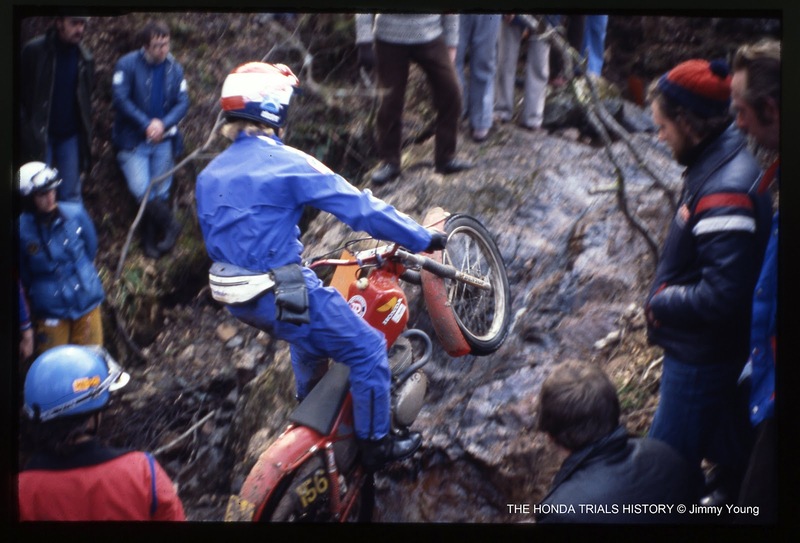 © Pictures Copyright Mr Roberston throught The Honda Trials History. Pete Jerred, a dealer from St. Ives made some special bikes based on the Honda XL125 engine and enlarged to 220cc capacity. Some of these bikes rode at SSDT in 1979. Nick Fossey rode at this SSDT year with this bike, also Nick Holt as you can see in this picture sent by the friend of this site Jimmy Young. Thanks also to John Moffat I know that was in 1979 Scottish Six Days Trial edittion and the section of this picture was Ben Nevis. The nice TL200RII was biult by RSC, Racing Service Corporation. As the contemporary RS200T and RS220T where produced in a small quantities (360 units white color and 150 red color). Frame number began from number 2001. From 2001 to 2360 frame number the TL200RII had a white painted fiver petrol tank, with a vertical transparent strip to see petrol level. Also had the old Honda logotype at both sides. Second productions, from 2360 to 2510 were painted in red and finished with the yellow Honda wings decals. ©Picture thanks to Patrick Verrier, This pictured unit was rebuild using and respecting all the original Honda parts. Also the painting was exactelly as it was produced in 1979. The engine number on crankcase began with the RS leters. Fully engine was painted silver gray. The frame was black painted diamond steel, with also steel swing arm. TL200RII had a tubular diamond steel swing arm that later was replaced for the right-angled aluminium one on the RS200T. Front forks were still Showa 31mm diameter that also were replaced on the RS’s that mounted strongest ones, 33mm diameter. Thanks to Hap Oswald from California, US, for this TL200 picture, a nice start for a great Trials bike restoration. This model used the XR 185 engine upgraded to 200cc by RSC. The bike was thought for a Trail use with a enlarged seat, red painted frame and also red mudguards. This model was lttle bit far from the competitive Trials RSC dinasty models. Anyway interesting and nice model, well accepted in several markets as Belgium in Europe. The very nice RS200T was built from RSC, Racing Service Corporation mounting a Gasoline engine, air cooled 4-stroke cycle, single cylinder inclined at 15º with 197,74cc displacement. The RS200T had the frame number following the TL200RII, and began with the 2510. The RS200T had alloy red painted fuel tank and fiber support seat with oval windows on sides. The swing arm were on these units light alloy made, had other details as the perforated rear aluminum axes. Later RS250T had also the front one perforated. Replacing the TL200R small front forks the RS200T was 33mm diameter Showa forks. First RS200T bikes had plastic engine plate protector, and later RS220T and RS250T were equiped with strongest aluminum plate. Also shape of the plate was increased a little bit on the side wings. The RS220T was exactelly same construction but increasing engine desplacement from 197.7 cc to 222.4 cc. All these bikes were produced in a really small series. There is several informations saying that around 400 units were made. I don’t know exactly the figures, but in my opinion the production was bigger. This nice unit on the pictures has the 3201 serial number, but seams one of the latest RS200T produced. Knowing that RS200 serial numbers began on 2510 number, at least 690 units were made. Maybe 700 units? Spanish woman rider Alba Villegas riding the Honda Trials History’s RS200T in a Catalonia Championship Classic Trials. Thanks to Eiji Yoshida よしだ　えいじ from Japan to send me his nice RS200T picture. Honda RS220T restored by Xavi Salvat using the Yamamoto colors (three banded). Thanks Xavi! Thanks to Jimmy Young we can enjoy with this nice picture. Eddy Lejeune rode in 1980 at Scottish Trials with the Honda SEELEY. I was discussing to John Moffat about this unit because we are not 100% sure about the engine. In Moffat’s opinion the engine was a RSC 250cc, but I’m not completely sure. About the bike it is clear was a Collin Seeley one. © of the Picture Jimmy Young. Based on the XL 185 trail bike, and increased to 195cc from Honda Racing Service, the frame builder Colin Seeley made for Honda Uk this little machine and iniitially planned to build 400 units. First prototypes of this bike were made in 1977 and rode by Rob Shepherd as official pilot achieving the 4th position on his first championship and 10th position at same time by the US rider Marland Wahley. Also Eddy Lejeune rode his first SSDT in 1980 with the 200 SEELEY, he was 12 position and the Best Newcomer. Officially dating from 1979, finally I’m not sure about the final production. But, be carefully because there is some “replicas” on the market. Let me note that this unit (picture on the top) has a wrong exhaust mufler due to the difficult on the finding spares from these rare bikes. The right one was the same as the contemporary RS’s mounted (TL200R, TL200RII, RS200T, and RS 220T) wit only one outlet exhaust tube and the RSC engraved logo. Nice 1979 SEELEY restoration sent by Stuart. Two nice pictures from our friend site Joakim from Sweden. Just finished restoration. Take a look at number plate…the Honda Trials History logo sticker, thanks Joakim! From Italy and thanks to the friend of this site Paolo Razzini two nice pictures from his very nice restored SEELEY. Thanks Paolo! Many thanks to Ramon Seuba to have the kindness to inviting me to take this pictures from his nice restored Fraser DMW frame. The picture was edited by The Honda Trials History. Thanks also to Patrick verrier for the additional information and documents sent to me. I also would like to thank to the friends of The Honda Trials History Patrick Verrier and Olivier for its special collaboration on this FRASER DMW folder. Please respect the © Copyright of all these pictures and documents who owns to the collaborators of this webpage. In 1979 David Fraser of Redditch made this revolutonary bike concept. He used a frame based on the idea to use the gas tank as part of the frame. I’m not 100% sure about following, but as I know, DMW (Dawson Motors Wolverhampton) developed these frames, Fraser bought 20 of them and assembled 8 using 2 stroke Villers engine and 12 using the Honda 4 stroke 125cc from the TL 125. This old document, is a funny picture found by the friend Olivier, from a Japanese book taken at SSDT 82-83. XL125 Honda engine is fitted in this unit.